A spring peeper at full croak. Listen for these harbingers of spring as they emerge and congregate near swampy ponds, pools and wetlands in early March. Learn about Spring Peepers, one of the first signs of Spring. Males fertilize eggs as females lay them. Eggs attach to vegetation in shallow water, and hatch in three-to-four days. Tadpoles metamorphosize two months later. Though common in Missouri, this species needs access to ephemeral, swampy ponds and pools in woodlands, and has become threatened in states where wetland habitat has shrunk. 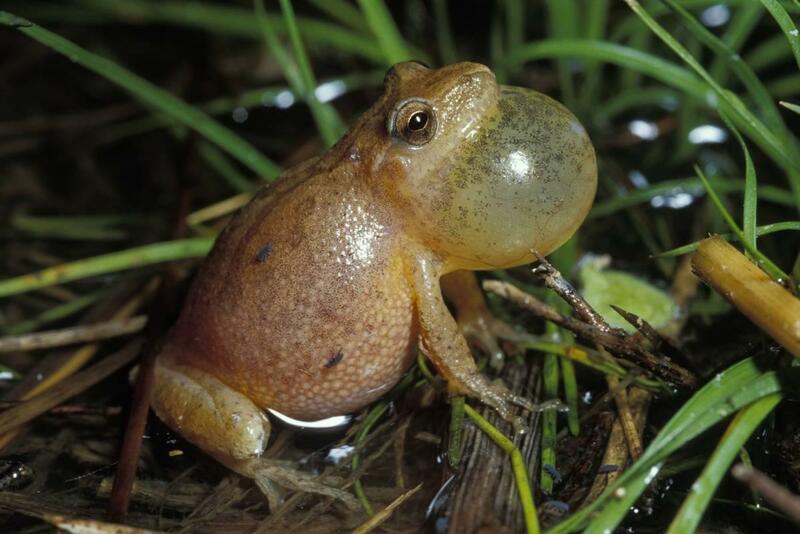 Learn more about spring peepers and other frogs emerging this spring with the Missouri Department of Conservation’s online field guide.